The germ theory of teaching goes like this. The teacher knows something and wants to transfer that knowing to learners. So the teacher tells and shows that knowing to the learner. This may be done live or by means of a book or video. Often, some mix of all three. 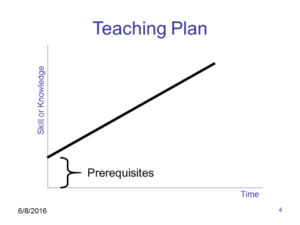 Teaching a subject moves at some pace, as shown in this graph. The teacher assumes the learner has some pre-requisite knowledge and builds from there. The hope is that the teaching can be done so well that most of the learners catch the new knowledge. That’s why I call this the germ theory of teaching.